Chamber of Darkness is a pixel beat ’em up adventure game from The Crow Studios, with some platforming elements.You play as a fearsome knight, looking for a way to break the curse of the spear that will absorb the knight’s body if not fed by killing other creatures. Play as a fearsome knight on a journey filled with challenges. 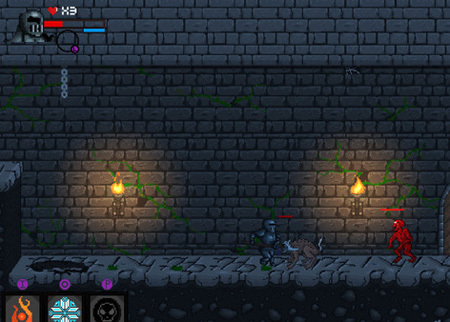 Use a variety of abilities and powerups to take down enemies in an abandoned, torn by war castle. Actions with the spear like attacking or using abilities cost HP depending on what ability you use, and you regain the used HP by landing a successful hit.Enemies have a chance to parry your attacks and reflect your projectiles. You can choose up to 3 abilities from 14 of all before the start of the level. There are 24 challenges separated into 5 categoreis. Beat all the 20 levels in Story Mode, or play as an enemy and fight the hero in Monster Mode. If you get stuck in the game, check out the video walkthrough and gameplay for the game. This entry was posted in PC Games, Walkthrough and tagged Chamber of Darkness Cheats, Chamber of Darkness Game, Chamber of Darkness Gameplay, Chamber of Darkness Guide, Chamber of Darkness Hints, Chamber of Darkness Review, Chamber of Darkness Solutions, Chamber of Darkness Strategy, Chamber of Darkness Tips, Chamber of Darkness Walkthrough by Marvin. Bookmark the permalink.